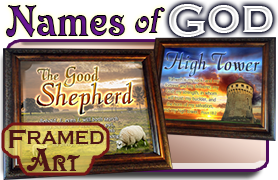 Custom Bible Verse Art in Large 10x12 Frames. 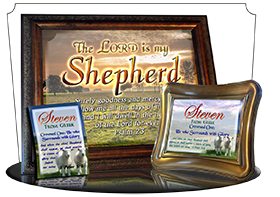 Elegantly display this Personalized Scripture verse art with your own favorite verses! This area of the site is completely new! Which means there might be an error or two. If you find one, click the chat↘ or give us a call. we can't fix 'em all. 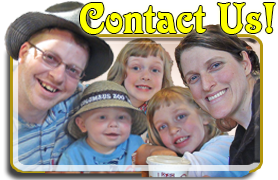 If you have any questions, just contact us by phone, chat box↘ or e-mail. For a list of inspirational Bible verses, just browse the samples, or scroll down this page for a list of popular Bible verses. Ordering is easy! 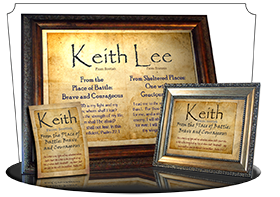 We've built an interactive order form to present our designs in a variety of frames, with a variety of options. 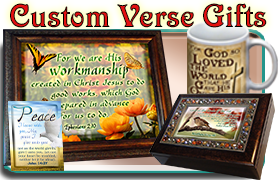 Just visit one of the categories above, and flip through the Bible verse art until you find the one you want. Then decide on a frame style and any extra features you'd like to add. Then enter the verse reference and version you'd like to see on the plaque, (e.g. "John 3:16, KJV" or "Ephesians 4:32, NIV") You also have the option of donating towards our savings to adopt a baby! Our daughters make bead bracelets and crochet'd necklaces in thanks for your donation. Then click Add to Order and check out when you're ready! And you're always welcome to order by phone: 888-763-2646. 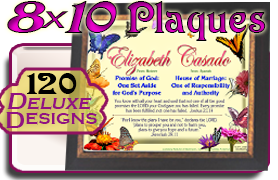 We also offer some great additions to your Scripture Plaque! 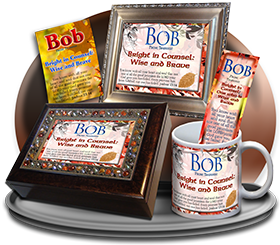 You can get a matching Pocket Card or matching Bible Verse Bookmark, or a greeting card so you can present a personal message with your gift. 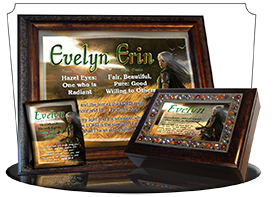 Many people add the custom inscription feature, which is a short personal message (from you) that is printed on a parchment label on the back of the plaque. 888-763-2646! 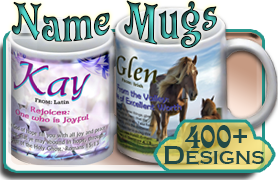 It helps if you've browsed through our designs a bit to find the one you want. 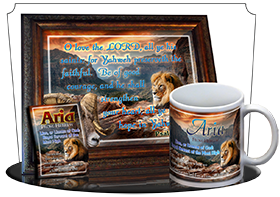 Use the orange menu at the top of the page to browse our Custom Bible Verse Gifts. Browse our Bible Verse designs using the yellow menu at the top of this page. 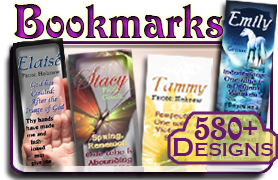 Flip through the designs on each page using the arrows or the menu on the lefthand side. 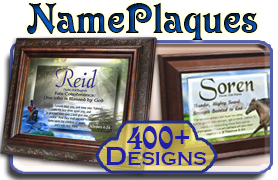 Beneath the picture, you'll see several options for framing your plaque. There are almost always several frames to choose from, or you can buy the 8x10 print and frame it yourself! If you're in a real hurry, consider the color PDF which you can print right from your computer. 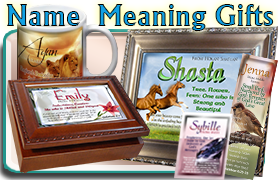 Once you've chosen a frame, there are some great "extras" you can add to the order, like a matching bookmark or a custom inscription on the back. If you choose the personal message/inscription, a green box will appear for the text you'd like to include on the back of the frame. Next, type in the verse reference and prefered translation in the green box. (e.g. 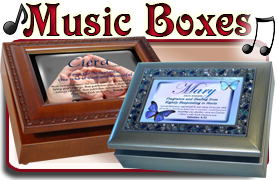 John 3:16, KJV or Romans 8:28, NIV) Some of our larger plaques have space for two verses, so when that is the case, just enter both verses in the green verse box. Lastly, you can consider adding a donation towards our adoption fund. My daughters have created beautiful hand-made bead bracelets and hand-made crochetted necklaces that they will send as a thank-you with your order. From there, you can continue to fill your shopping cart or click the PayPal-checkout button to complete your order. If you don't like PayPal, you can enter the code "PayByPhone" into the discount code area to send us your order without entering any credit card info. Then all you need to do is call us with your payment details. If you have questions along the way, or would prefer to order by phone, just give us a call at 888-763-2646. 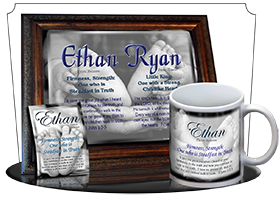 Our large personalized prints are 8" tall x 10" wide, and fit in most standard "eight-by-ten" frames. We use a high-bright, high-quality gloss paper from Hammermill papers using a digital HP 4700 color laser printer for crisp, fade-free, smudge-free graphics. 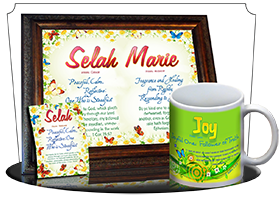 The result is a bright and vivid full-color design that will communicate a message of encouragement for years to come. You can purchase our personalized prints by mail, by eMailed printable PDF, or choose a framing option! We use 10x12" frames that are commonly called "eight-by-ten frames" because they hold prints that are 8x10". The outside dimensions are usually 10x12; sometimes larger depending on the thickness of the frame. 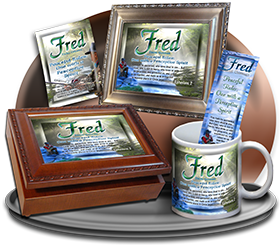 The prints are behind glass, with hanging hardware on the back for wall-mounting, and a fold-out easle-stand for display on a desk or fireplace mantle. 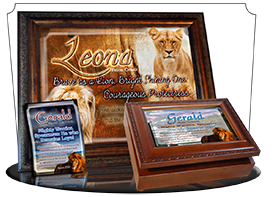 The Ornate/Frame 1 option is our most popular frame, with a dark-brown wood coloring and intricate scrollwork designs. It is a very sturdy, medium-weight solid plastic material that presents like real wood. All our large frames include hanging gear and a fold-out stand on the back, unless otherwise noted on the picture of the frame.